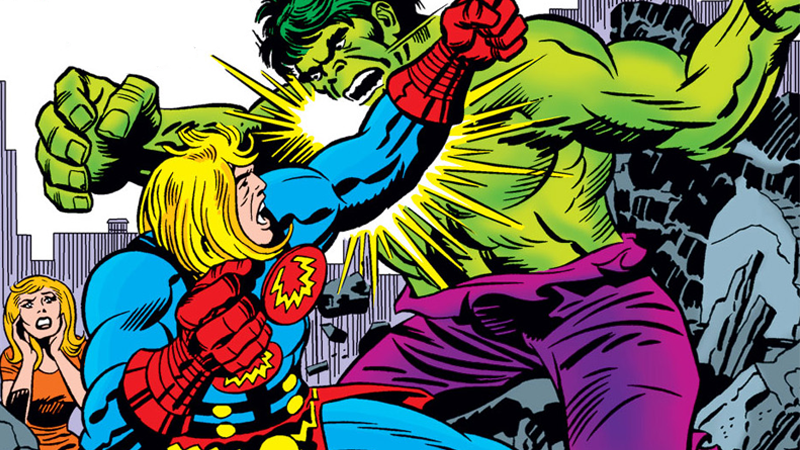 Ikaris goes toe-to-toe with the Hulk on the cover of Eternals #15. We still don’t know a lot about Marvel’s movie plans after Avengers 4, but one teased project in particular got a huge boost last Friday: the Eternals, a quirky ‘70s group of characters created by the legendary Jack Kirby, are getting a movie from director Chloé Zhao. Unfamiliar with what could be the new faces of the Marvel Cinematic Universe? We’re here to help. Understanding The Eternals requires a bit of a leap back to before their creation—and even to another comics publisher. At the start of the 1970s, Jack Kirby left Marvel Comics. This departure came after a creative run which had seen him help bring to life some of the publisher’s most iconic superheroes—but he was steadily worn down by growing discontent with the way he was credited and treated for his work at the company. Finally deciding enough was enough, Kirby jumped ship to Marvel’s biggest rival, DC Comics, and immediately started work on his next great epic: the Fourth World, a cosmic realm of gods and otherworldly beings that gave birth to the New Gods pantheon of characters and one of DC’s most infamous villains, Darkseid. But while Kirby launched an array of books that kicked off this brave new frontier, his time at DC didn’t last. Just five years later, Kirby found himself unsatisfied with being forced to work on projects he didn’t want to, and decided to return once more to Marvel. And that’s where The Eternals, the first series Kirby created after his return to the company, finally comes in. So why did you need to know about DC’s New Gods before that? Because basically, The Eternals is kinda Kirby’s Marvel riff on his own work. Ikaris explains the difference between Deviant, Human, and Eternal in Eternals #1. Launched in 1976, The Eternals followed the titular group of characters: an uplifted subrace of humankind who’d been experimented on by the Marvel cosmics’ all-powerful divine entities, the Celestials, five million years in the past. The Celestials (for non-comic readers, beings like Star-Lord’s dad Ego in Guardians of the Galaxy Vol. 2) created two separate races out of their experiments: the Eternals, human-looking, quasi-immortal beings with superpowers; and the Deviants, a grotesque, monstrous byproduct of the experiments that created a race of vengeful beings who would be forever envious of the Eternals. The Celestials tasked the Eternals with using their superpowers to protect the Earth from the threat of the Deviants, and then went on about their merry cosmic way. Interestingly, it was retconned that a faction of Eternals left Earth and headed first to Uranus and then to Titan, making the cosmic beings that hailed from those planets (the Uranians and Titanians) Eternals rather than separate races. So technically, we’ve already met an Eternal in the MCU: Thanos! (Even if the film didn’t actually acknowledge that comic book factoid about the Mad Titan.) Thanos isn’t a full Deviant in the comics though, but rather an Eternal born with the “Deviant syndrome,” a mutant in Eternal biology that gives him some of the defects of the Deviant subrace. While each Eternal has different individual powers and abilities, they have a few shared traits. Aside from long-lasting life and regenerative properties, Eternals could also manipulate cosmic energy in a similar manner to the Celestials, and any gathered group of three could merge their forms into a psionic entity known as a Unimind, which amplified the powers of the three Eternals it was made up of. You know, kind of like the gems from Steven Universe. The Eternals (and Kor the Deviant) officially meet humankind in Eternals #6. Kirby’s Eternals series would also be short-lived—it only lasted until 1978. It saw the Eternals, lead by Ikaris, make themselves known to the wider world after the arrival of a new host of Celestials on the planet, prompting an attack by the Deviants that drove Ikaris (who had been operating under the human guise of Ike Harris) to reunite with Sersi (who could craft illusions and move objects with her telekinetic powers), Makarri (who specialized in superspeed), and Thena (who manipulated cosmic energy to shoot beams of heat and light). The Eternals themselves would slink back into their hidden city of Olympia (based, you guessed it, on Mount Olympus) and into the background of the Marvel universe. But their role in the foundation of practically everything we know of Marvel’s Earth, and connections to the wider cosmic diaspora, has made them important tools to be used in other series. The experiments that made them are sometimes seen as the foundation of the existence of superpowers on Earth full stop, and Kirby envisioned the long-lived beings as the Marvel universe’s equivalent stand-in for the ancient gods of Greek, Egyptian, and Roman theologies, as the Norse pantheon was to the Asgardians. While the characters would exist in their own miniseries again in 1985 and 2006 (which led to another quickly-canceled ongoing series launched in 2007), the Eternals have mostly stayed far in the background in the comics. But, if the rumors that preceded Feige’s confirmation of potential plans for an Eternals movie are to be believed, one major character from the second of those miniseries, by Neil Gaiman and John Romita Jr., could be a significant player in the movie: Sersi. Sersi, as she appeared on the cover of Eternals #2 in 2006. Sersi has been around for a lot longer than the 2006 Eternals series. She actually first showed up in the third issue of Kirby’s Eternals series, and eventually became a prominent member of the Avengers after that concluded. It was revealed that Proctor, an alternate-reality version of her boyfriend Dane Whitman (the medieval superhero Black Knight), was hatching an elaborate plot to murder every version of Sersi in the multiverse for rejecting him in the greatest overreaction to being turned down in comics history. The Eternals came to Sersi’s aid, but she was so traumatized by Proctor’s meddling, she peaced out and opened a gateway to a limbo realm between the layers of the multiverse to hang out with Black Knight, never to be seen again...well, until she reappeared in that 2006 series. Doctor Strange and Iron Man discover that Olympia has fallen in Avengers #4. Because they’re all pretty much dead now. The current run of Avengers—penned by Jason Aaron, with art from Ed McGuinness, Paco Medina, Mark Morales, David Curiel, Juan Vlasco, and more—opened with a story arc about the return of a race of “Dark Celestials,” a group that had been corrupted by their cosmic balance check, an insectoid swarm dedicated to feeding on the energy of existence called the Horde. The deaths of several Celestials to the Horde’s cosmic bloodbath—as well as the revelation to the Eternals that they were not designed as humanity’s protectors by the Celestials, but instead a virus that could be cultivated to destroy the Horde—drove the Eternals insane, causing them to kill themselves and each other. Ikaris passes on the power of the Unimind—the legacy of the Eternals—to Tony Stark before dying. Pretty much every notable Eternal (including the original team) is dead, but not before Ikaris granted Iron Man the ability to use the Unimind during the Avengers’ cataclysmic battle with the Dark Celestials. Obscure as they are, the Eternals have a long and confusing history interwoven through decades of Marvel comics. The basic beats of their gimmick have even been introduced into Marvel’s live-action universe, through the similar “hidden superpowered subrace of mankind” tropes found in the Inhumans (which could also crop up again with the X-Men, now that we live in a post-Disney/Fox deal world). Suffice to say, they’re a perplexing choice as a potential force in Marvel’s grand “Phase 4” plans and beyond. But obscurity and comic book weirdness have not stopped Marvel Studios before—after all, look at Guardians of the Galaxy. Not only do the Guardians films provide evidence that the Marvel Movieverse can turn barely-remembered comics characters into box office stars, they sow enough seeds between the Celestials and the cosmic diaspora of Marvel’s spacebound characters that there’s already a path for the Eternals to carve into the box office. Who knows, maybe Zhao’s film will herald another wave of unlikely movie heroes?